Too many people work on a one-person audio team. No vacations, no sick days, and burnout is just around the corner. Now imagine recruiting another person to join the team and that team growing. But how does that happen? 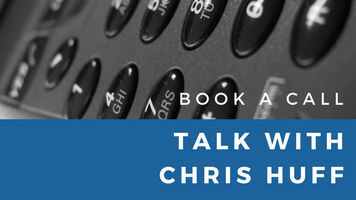 In this episode, Chris details the exact steps to take to recruit and train a new person. Welcome to the behind the mixer podcast,I’m Chris Huff..and I used to be a one-man audio team. If you’re in a similar situation, I’m here today to provide some help, encouragement, and some more help. Back them, I was single and spending every Sunday mixing was fine by me but I knew I’d have to deal with sick days, vacations, and in time as it turned out, I was working a paying job on the occasional Sunday. The bottom line was that being the solo sound guy was ok for know but that needed to change. The landscape for learning audio production was completely different back then. The internet was nothing like what we see today and there were only a handful of books available on Audio production and you had to go to the store – this was pre-Amazon days. Ok, I feel old. Anyway. I knew I couldn’t build a team until I could teach a team. And months later, that’s exactly what I did. But I’m not here to talk about me, I want to talk about you. First, I want to speak directly to you and where you are. From what I’ve discovered over the years, there are one-person teams in big cities, rural towns, and all points in between. There’s never the assumption that just because your in a big city that there are plenty of volunteers. And thanks to the internet and the huge online community via the BTM facebook group, I also know there are one-person teams in some of the farthest reaches of the globe. So, to every one of you who rocks it every weekend running sound, THANK YOU for doing what you do. We’re going into the Christmas season and while many people vacation to be with family, you’re running sound at your church. I’m running sound myself on Christmas but in my case, it’s just how the scheduling worked out. I’m going to assume since you’re listening to this podcast that you’re already learning everything you can about audio production so I’m not going to address that. 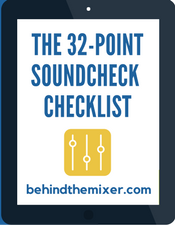 Through the behindthemixer.com web site there are plenty of resources for you that can get you mixing great every weekend. SO instead, let’s focus on how to build your team. I’ve seen all sorts of attempts at recruiting people onto the team. But for you, I don’t want you passing out flyers, running advertisements, or walking around in a full body microphone. I want you to make it personal. Start by jotting down a list of ANYONE you know who isn’t otherwise volunteering at the church on Sunday mornings. You can even add to that anyone who is volunteering but doesn’t seem to be happy in their role. The closer you are to these people, the better. Next, cross out anyone who is always late for church or otherwise just not right for audio production. I’ll leave that up to you as to how you see that. I once heard it described as look for someone willing to learn and who is also punctual. From here, don’t assume anyone isn’t interested in audio. Don’t go by age or gender. I will say that anyone over the age of 13 should be considered, though for building a team this early, I would look for someone much older. Next, approach the person and ask them if they’ve ever considered running sound. There first statement will likely be, “I could never learn what all those knobs do.” Tell them it’s easier than it looks. Tell them you’re building a team, that you’ll train them, and before they even say yes or no, ask them to shadow you for a Sunday service (including practice time.) It’s during that time, they can see what you do, why you do things, and during a practice you might even let them EQ a channel or balance the volumes of the band. The bottom line is you’re showing them not to be afraid to touch the equipment and they can learn it if they put the time into it. But you also need to let them know you will teach them. The study time is where people have questions like, how do i teach them, what do I use to teach them, how often do I teach them. These are all valid questions and fortunately, I have the answers. So let’s break this down into the steps you should follow. I found it best to break this up over a couple of days or weeks. For example, two Monday nights in a row. While I do my on-site training all in one day, it’s a lot to take in for a first timer. Also, it seems like everyone is busy with something. That being said, if the person is willing to be available for a full day, like on a Saturday, then do that. Determine how to teach them. There are a number of ways to do this. My preference is that you teach them. THis enables you to mention scenarios and problems that are unique to your sanctuary or mixing space. For example, you might say you have to keep the low-end to a minimum because you’re in a space without any acoustic treatment and everything reflects sound. Or, you might explain why they need to use a certain mic procedure on drums or a certain microphone with a vocalist. They will also have questions and I like to be able to pause during the teaching time to answer questions. I tell people that if they are confused about something I’ve said, feel free to ask for clarification. For all other questions, hold those until the break. I usually teach for 50 minutes then take a ten minute break. If you are teaching one-on-one, you have more flexibility in how you do this. This topic came up in a recent discussion and there seems to be two overall opinions. One group says to create your own instructional material and teach from that. I’m not against that but I believe the other group has a better way. 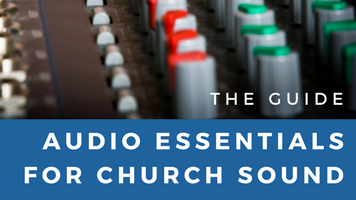 I designed my guide, Audio Essentials for Church Sound, to get anyone up to speed in how to successfully run live audio. But I also designed in in a way that it works as a teaching guide, covering topics in the best way AND at the best time in the order of things. When I teach in-person, it’s what I use. And that’s where the other group comes in. They grab a copy for each person they are teaching and then use their own copy as a teaching guide. This way, the volunteer has their own copy for later reference and you have a detailed teaching guide. And AECS teaches more than just the technical, you also get all the communications and ministry-related topics. Now it’s time for lab time. Just like when I was in school, we had class time and the practical application lab time. Have the person show up for setup and soundcheck times when you do. In short, they need to be there when you are there. They will watch you work in the booth and they will help you on the stage. IN time, you should be able to say, “go set up the stage” and they should be able to do it correctly. During these times, they are also watching you interacts with the musicians and the band. When it comes to mixing time, like I mentioned, they will start by observing you. You can use this time to ask them questions like, do you know why I I applied that EQ change OR what do you think the vocal mix needs? After a few weeks of this, you change places, being the observer throughout everything. They mix, you watch. If they have questions, they can ask. If they make a bad mistake or some problem comes up, you are their to help. Finally, they are off on their own. I’m not necessarily recommending you go on vacation the first time they are mixing. But as far as they should be concerned, all responsibility is on them. At this point, you’ve recruited and training a new team member and you’re no longer a tech team of one. I do recommend taking this one step further. It’s a given that it might take the new volunteer some time to create a great mix. It’s usually stuff like figuring out how to EQ or mix a particular singer or instrument. Help them. 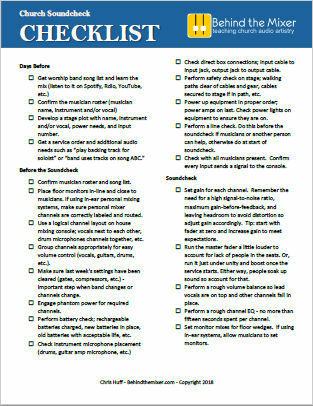 Spend time with them during a practice to work on their problem areas. 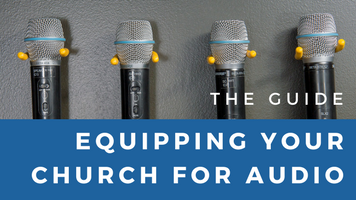 Oh, and if you use a digital mixer with the ability to perform a virtual sound check, them you can record the musicians or the pastor and play those back when the room is empty and use that in the training process. 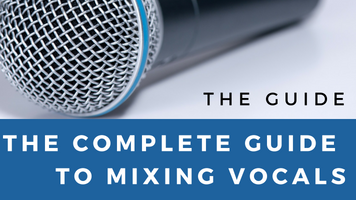 The tracks could be used during the training for examples, such as applying a narrow EQ cut, or you can use them for full mixing and have the new recruit try to mix from scratch. It’s up to you. Now let’s talk about growing the team to multiple people. How many and how often should they be behind the mixer? Personally, I mix twice a month at my church now. BUt as a new volunteer, I’d want to be mixing as much as possible. If you’re a team of two, go for every other week. But here’s where we get into some complex scheduling. Let’s say you have two services on a Sunday morning. How many people should mix? If the services are identical, I say one person for both services. If you have a situation where ther is a traditional style service a 8:30 and a contemporary service at 10:30, it’s up to you. 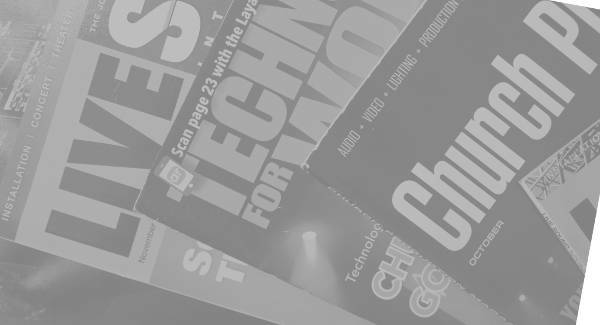 Let’s say someone want to run sound but only for the traditional service. I say let them. If they really want to serve and feel that particular service is where they want to focus, I say go for it. In that case, you have to schedule two people. What about Saturday and Sunday services? Hopefully you see how the complexity builds. My thought is when you run multiple services across days where the service schedule is the same, for example, same band, same songs, same sermon, then one person should mix all the services. But I need to return to the idea of how OFTEN a person should mix. If they are new, I want them mixing twice a month. Using the method I mentioned, by the time they fly solo, they’ve already spent some time mixing so that’s good. SO how big should your team be? If you’re running one or two services each week and the services are the same, you might look at a team of three. Maybe four. It’s really a matter of how often people are willing to be on the schedule. Once every three weeks would be a good rotation. What you need to be aware of is burnout. If you’re a team of one, you might already be battling it. Back when I was a technical director, I kept an eye on the health of my team members and would address such things as they came up. But I also went a step further and on an annual basis, ask each member if they wanted to do another year or if they needed a break. We all go through seasons, good and bad, and sometimes it’s best of a team member to step down for a while and focus their energy of themselves or their family. Thank you for listening to the behind the mixer podcast. I’m chris huff. Take care. Thanks Chris, another excellent article/podcast. In our medium sized church we have the computer that controls the video projection right next to the audio mixer. For years I did both, not an ideal arrangement many times I ran out of hands or missed a cue. Two years ago a reliable and skilled volunteer stepped up to run the video. He was good enough to get to church early for praise band practice and that was my opportunity to teach audio. After about 6 weeks we switched chairs. Now we alternate each week. It’s great having two sets of ears and eyes up there and we can each run solo if required.